Continuing on with my goal of doing at least fifteen minutes of hobby work per day I have recently started up several new projects that I have been meaning to get around to. 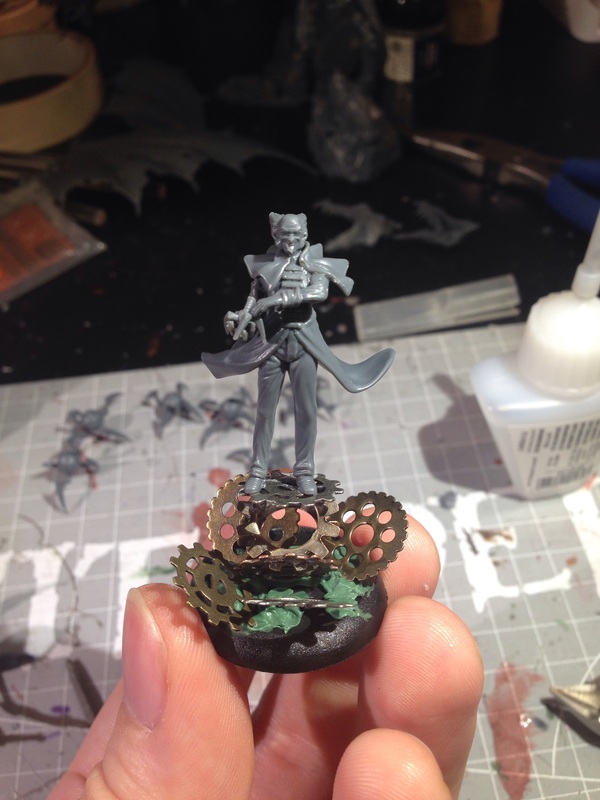 Here is a look at Ramos from Malifaux. He’s a steampunk sorcerer who makes all kinds of cool constructs to do his bidding, so I thought making it look like he is standing on a floating gear would look really cool. I am quite happy with how the basing turned out on this guy, really looking forward to painting him once I get a chance to throw some primer on him. 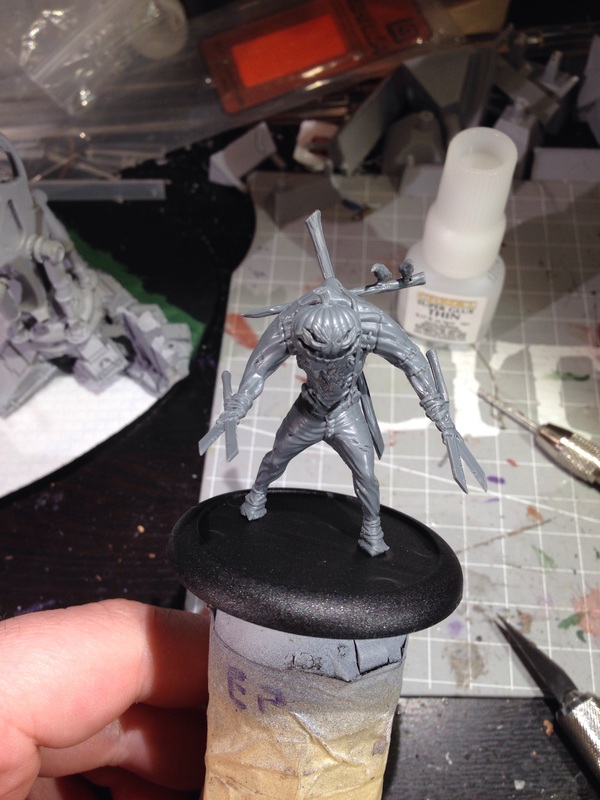 Also from Malifaux: the Carver! 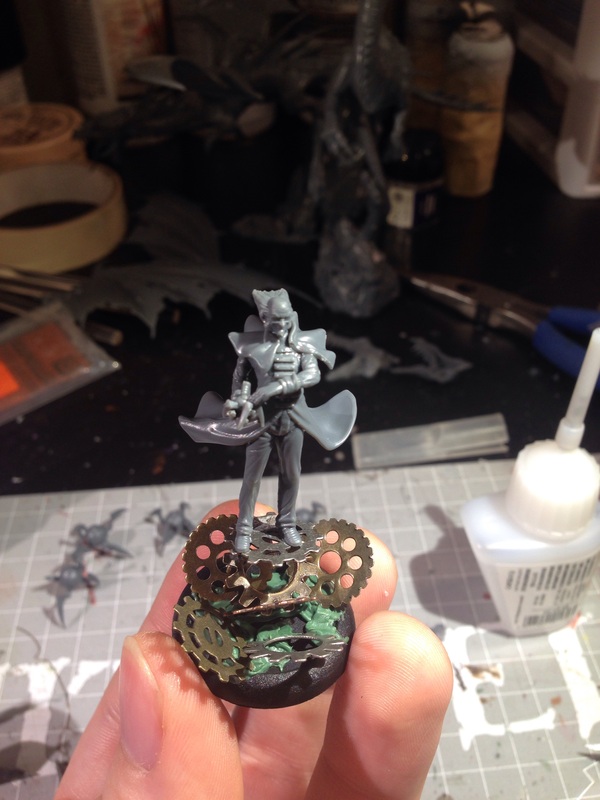 This guy is one of the cool new miniatures Wyrd brought out during their Black Friday sale. This creepy guy is supposedly going to be added to their permanent range, but currently is not available. Something fun with the Carver is that he is only usable in a special story encounter from the back of the Malifaux Crossroads book. While this means he may not be hitting the table all that often, I am really looking forward to painting him. I am thinking I might challenge myself with this guy and try to freehand a plaid pattern on the shirt he is wearing. I picked up the Forge World Cerastus Knight Castigator model when I was at Gen Con, but hadn’t gotten around to building it as I have been focusing a lot on my Malifaux stuff. 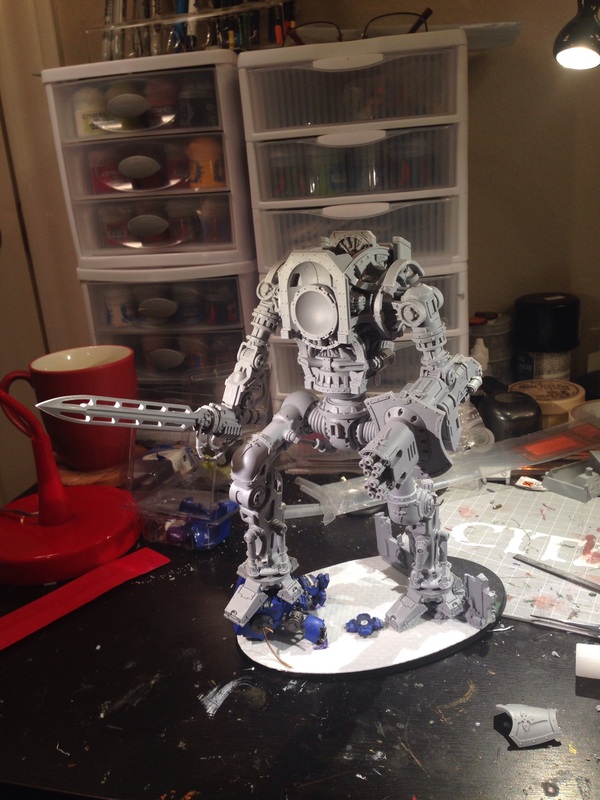 A guy in a local 40k group I belong to was looking for the directions for building a Knight on the Cerastus chassis, so I busted out my directions for my Castigator to share with him; luckily this inspired me to get building on my Castigator and what you see here is the result. 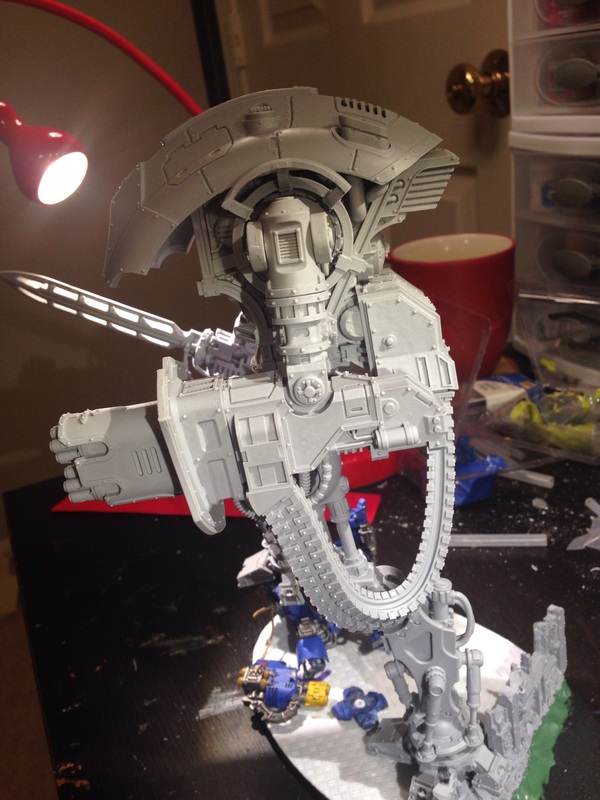 Once again I have decided to pose a model standing atop its vanquished foe, apparently it’s kind of my thing–check out my Sonic Dreadnought and Lucius the Eternal if you want to see what I am talking about (I also have a Contemptor Dreadnought sitting in my WiP queue that is standing atop a Tau Crisis suit which I haven’t photographed yet). I must say that this is a gorgeous model that was an absolute treat to build; as I bought it at Gen Con before it was available for general release, it is clearly from a brand new mold and had very few mold lines or flash to clean up. 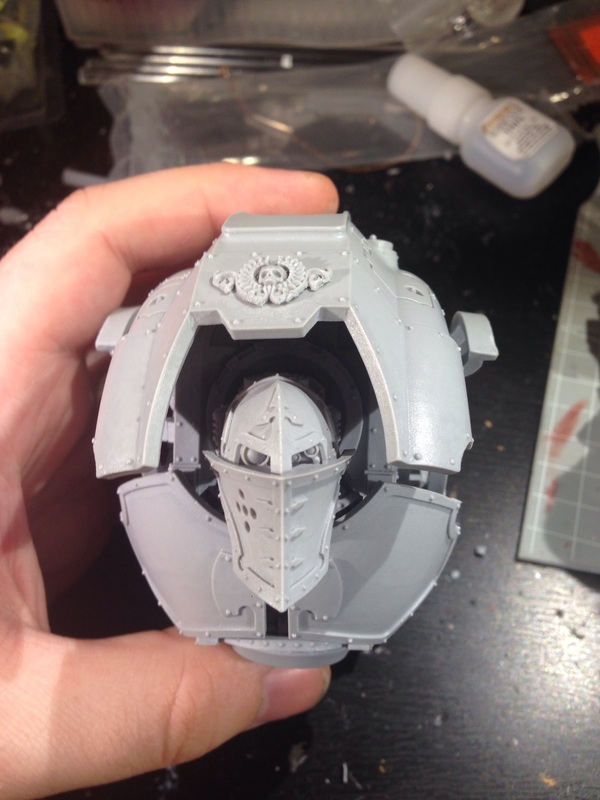 Since this is a Forge World piece in is obviously a good deal more complex of a model than the standard Games Workshop Imperial Knight kit. 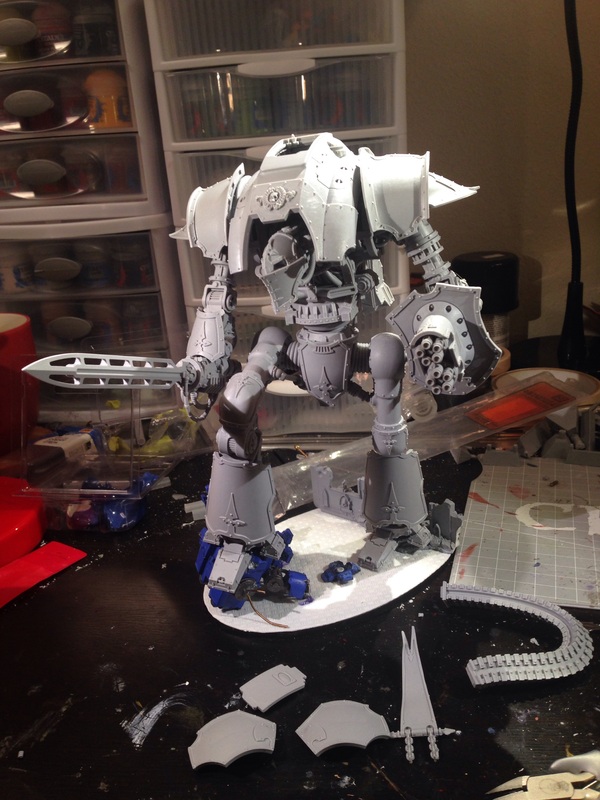 As you can see in the photos below this Knight is fully posable and I don’t have to mess around with crazy conversions like I had to for one of my other Knights. 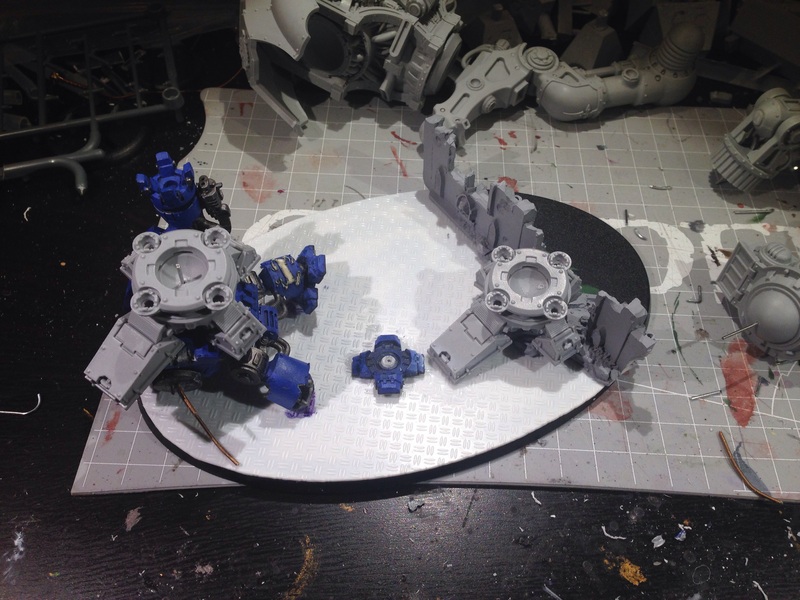 I ended up pinning most of the joints to make it easier to position the model before I glued it in place. 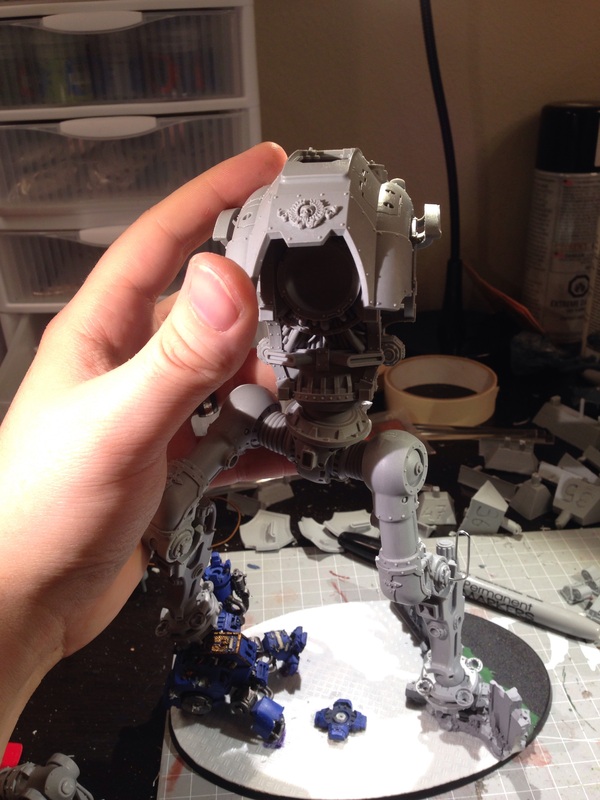 As I plan on painting this model in sub-assemblies, the torso, arms, head, and armor plates are removable. 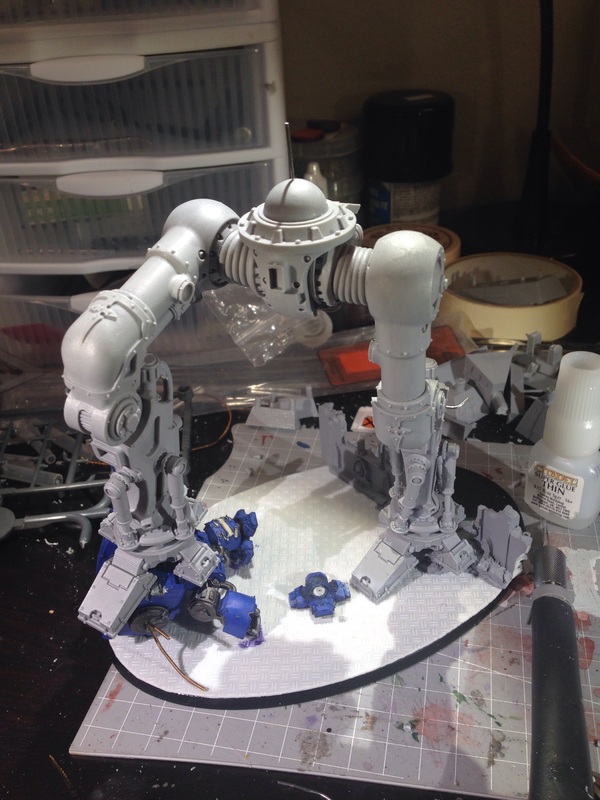 I still need to heat bend some of the cables and the ammo feed for the big twin-linked gatling gun, but otherwise this model is just about ready to get some primer and then time to paint! I was going to start building the Forge World Emperor’s Children Kakophoni I picked up at Gen Con, but I realized that I hadn’t given them a wash yet to make sure they were free of mold release; I threw them into some soapy water before I headed off to work this morning, so hopefully I’ll be able to get those guys all built over the next couple of days. I will be adding the Kakophoni into my sonic weapon themed Chaos Space Marine army; I love how they look and they’ll fit great as Noise Marines as they are the original Noise Marines. They will add some nice variation to an army previously made up of a lot of guys in very similar poses. 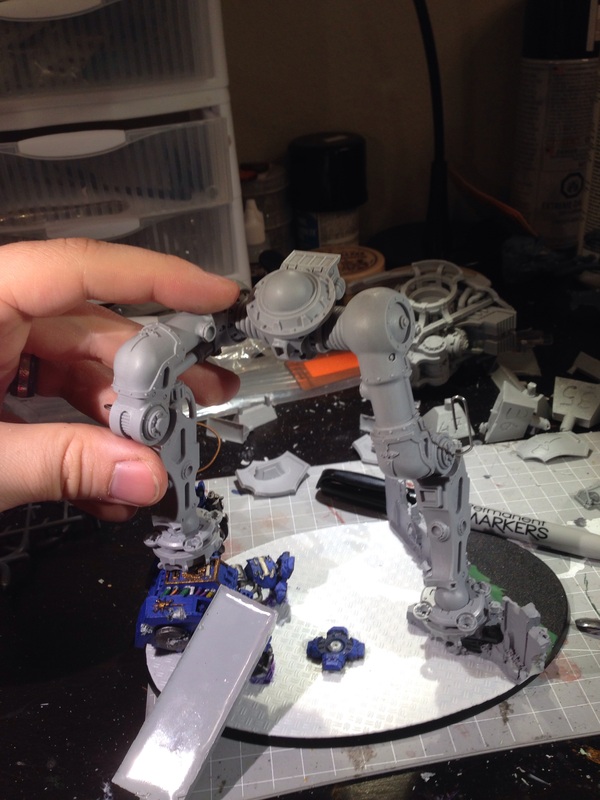 As soon as the weather warms up a little bit more and isn’t so rainy, I will hopefully be able to get all of this primed up and ready for painting (one nice thing about living down here in Texas is that it never stays cold for long enough for me to run out of stuff to paint). Review of Walk the Plank!